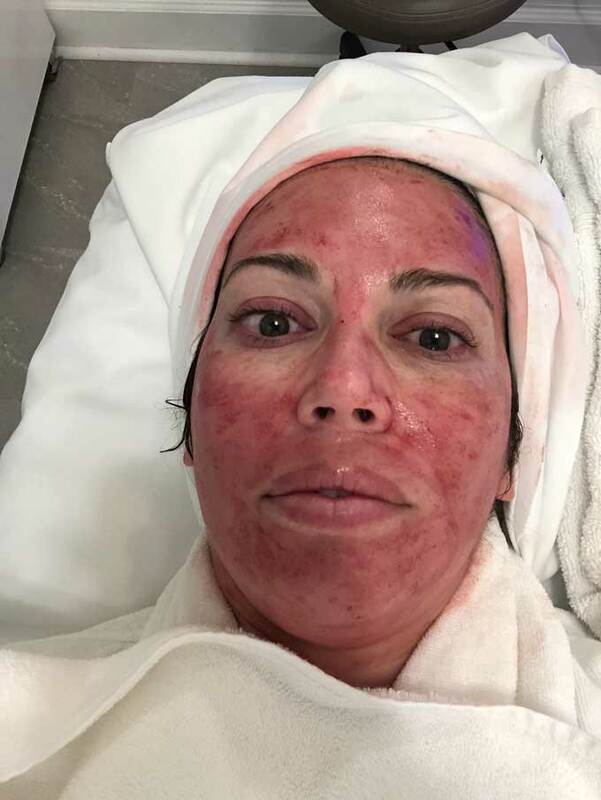 The Platelet Rich Plasma Facial, also known as the Vampire Facial, was made famous when Kim Kardashian West posted a selfie during the process. This unique beauty treatment can be intimidating, but never fear! 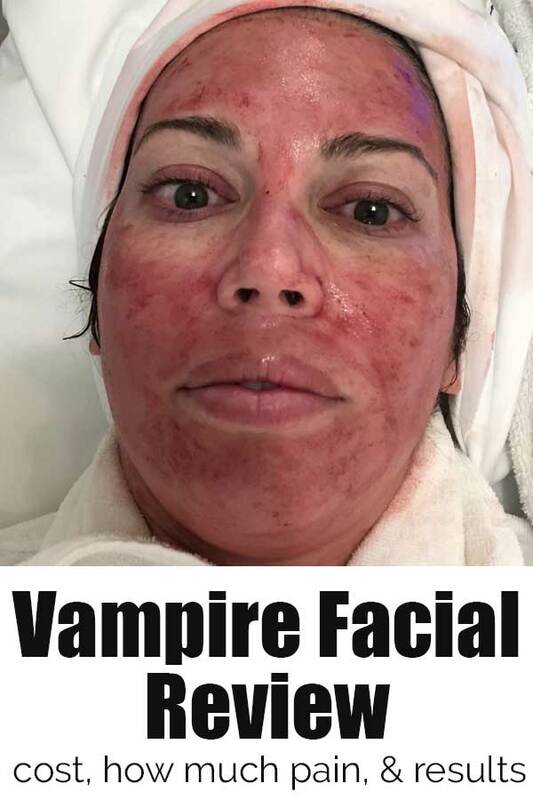 Read all about the vampire facial process, vampire facial cost, and see before and after results. 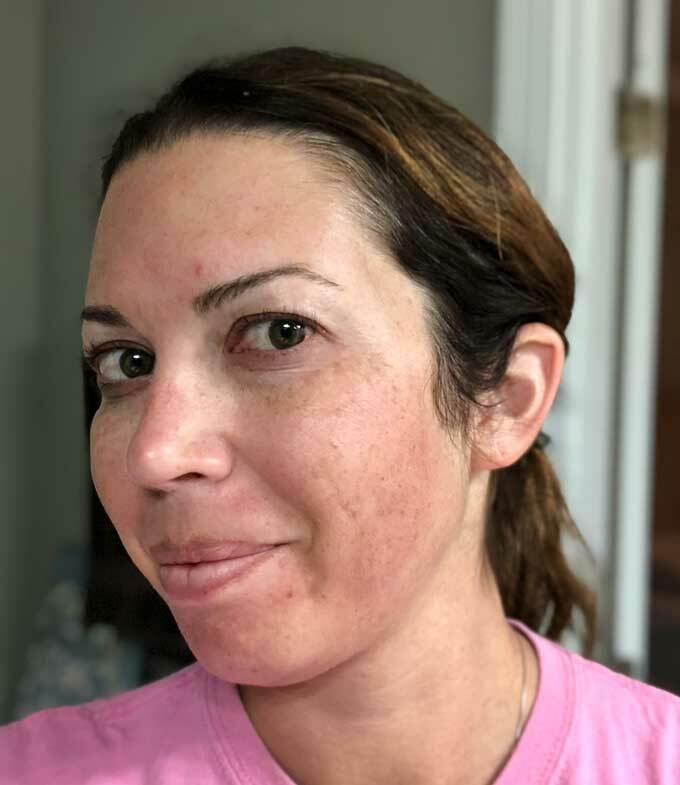 Bear with me y’all, I don’t normally show myself much on the blog and some of these pictures are pretty hard to look at but I did so much research before deciding to try a Vampire Facial that I wanted to share my experience in case it can help someone else decide. A Vampire Facial is another name for a Platelet Rich Plasma (PRP) Facial. In this facial your blood is drawn and spun in a centrifuge. The machine spins the blood to separate the blood cells from the platelets, which are rich in growth factors. The skin is then micro-needled with a special tool and the plasma is massaged into the skin immediately afterwards. Both the microneedling and the PRP induce collagen production. Most practitioners recommend a series of treatments and the treatments should yield better skin tone, skin-tightening, and better skin volume with results continuing to improve up to a year. Yearly maintenance is recommended after the initial series of treatments. 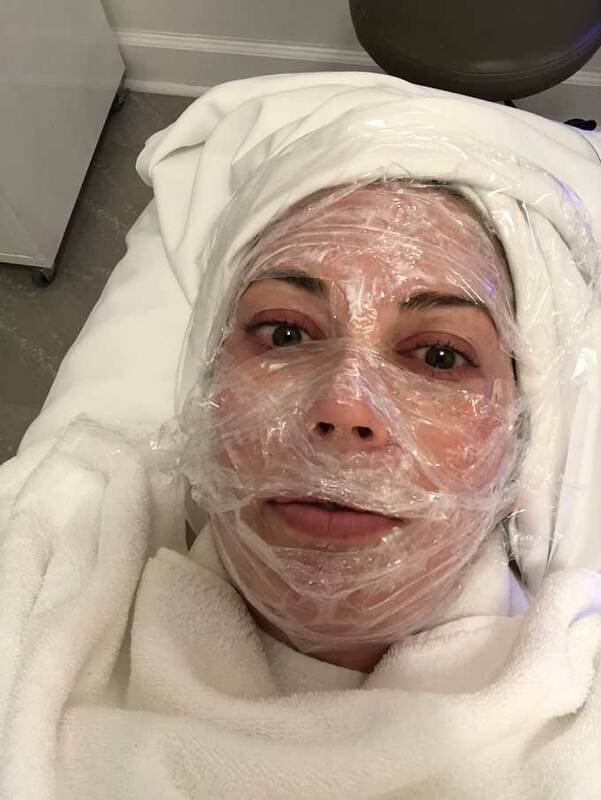 Why Did I Try the Vampire Facial? 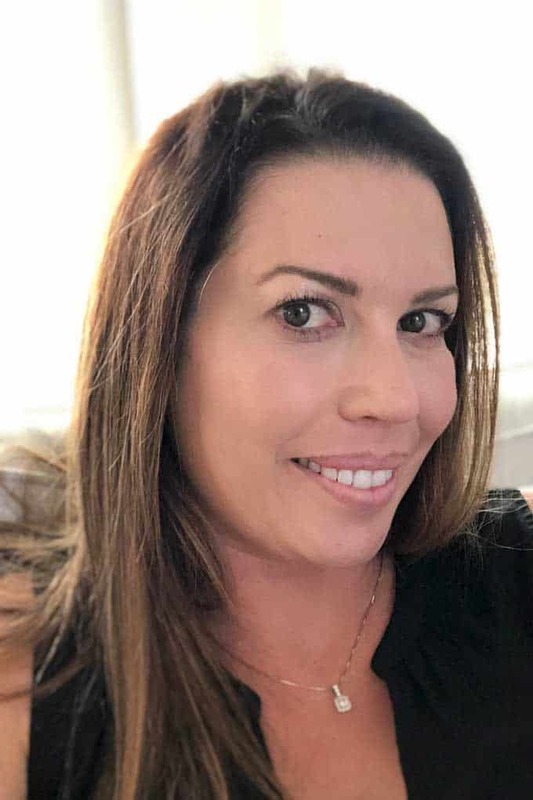 Honestly, I am 39 and my skin is not too bad. I never struggled with acne until recently as middle age (ugh) is bringing hormone fluctuations. My skin is dry and over the last few years, I’ve had more noticeable pores, a general dullness and of course fine lines. 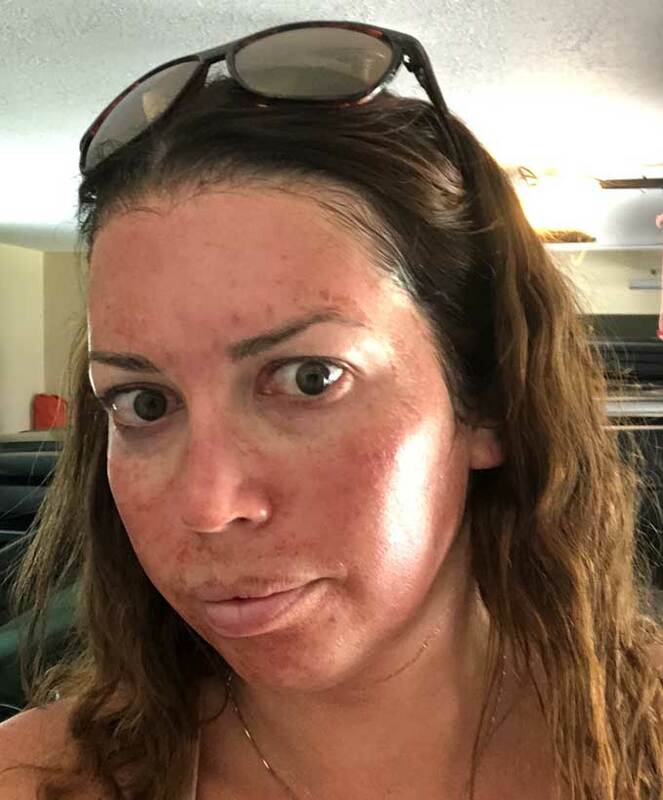 I have also started to have sun spots from those glorious carefree beach days all through my teens and twenties. I heard that a friend of a friend had tried it and it made me curious, so my husband bought me a package of three treatments as a birthday & anniversary gift. 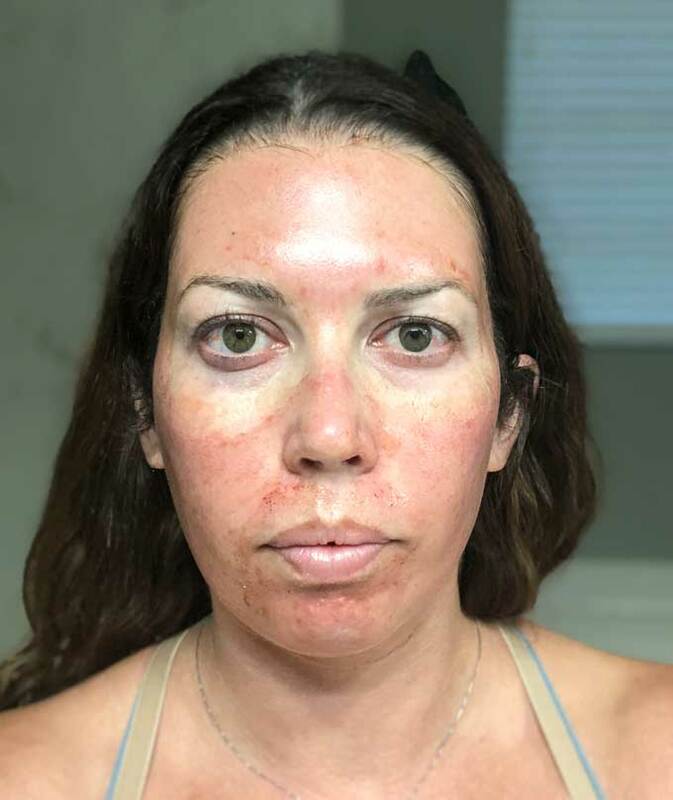 This is my skin prior to trying my first PRP facial. First the nurse washed my face while I was laying on the table, facial style. Next the numbing cream was applied over my entire face and plastic wrap was laid over top to increase the absorbtion. After 10 minutes the nurse returned to take my blood. One vial was taken out of my arm and placed in a centrifuge to spin. Twenty minutes after numbing cream was applied, my face was washed again, then cleaned again with Hibiclens. Once we were ready to begin the nurse, positioned behind my head, began to work in sections beginning with my forehead. The numbing cream made me feel only the pressure at first. She would smear some of the plasma on my skin then work the microneedling pen repeatedly over the area. I was slightly surprised how many time she worked over the same area over and over. 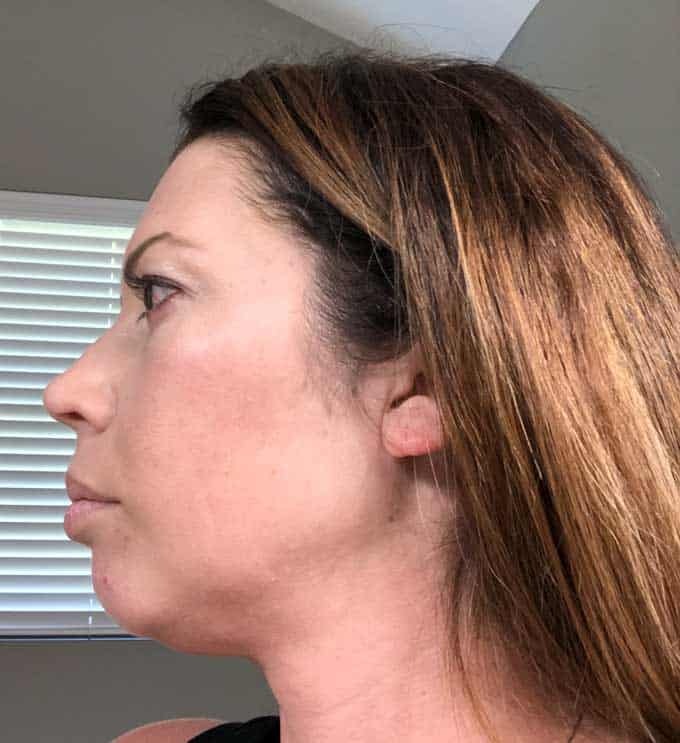 Towards the end of the procedure I felt like either the numbing cream was starting to wear off or my skin was so agitated that I began to feel discomfort. It wasn’t pain per se but definitely not pleasant and I was ready for it to be over for sure! The nurse adjusts the depth of the needles over different parts of your face so it’s not penetrating as deep on the thinner skinned areas like your nose and forehead as it does over the cheeks. After she was finished needling the nurse spread any remaining plasma over my face. Then it was time for me to sit under a Celluma light. This part of the procedure is probably unique to my practitioner but it made a big difference for me. The Celluma light treats a wide variety of conditions and also aids in wound healing. After sitting under the light for twenty minutes my skin was markedly less red and inflamed and also felt a lot better. Immediately after the procedure I literally could feel my pulse in my face and it felt tight and hot. After the light my only discomfort was the tightness of the serum dried on my skin. I highly recommend finding a provider that offers the light in conjunction with the PRP facial! The day of the facial itself is the worst, after that, it improves dramatically. The day of the facial I was told not to rinse my face for 8-12 hours. The plasma dries on your skin and makes it feel tight and also look shiny and blotchy. That, along with the redness made me feel a little bit like a freak show and I quickly made arrangements to not leave the house the remainder of the day. Let me tell you that washing my face that night was pure heaven! When I left the facial I was given a small vial of hyaluronic acid serum to use, and I also purchased some insanely priced serum and a gentle cleanser. I was instructed to use the serums and a plain gentle moisturizer for the first two weeks. Nothing with active ingredients. After those two weeks, I could add other anti-aging products and go back on retinol if I wished. Day two was better. I was told to avoid strenuous exercise or getting overheated so I skipped my regular workout and took the dog for a long walk instead. 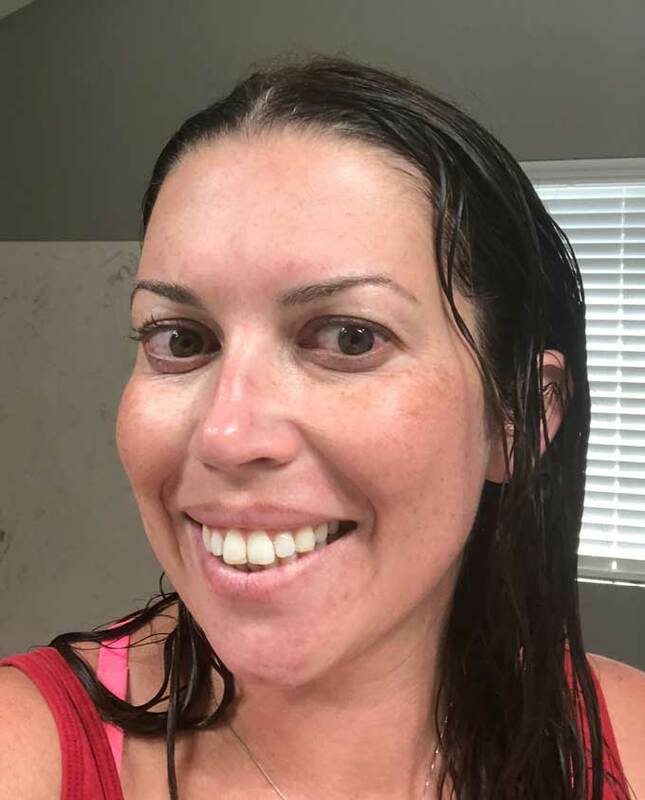 After 24 hours my provider told me I could wear makeup so that helped to disguise my red skin when running errands and attending soccer games for my boys! It did feel prickly if I got warm (it’s still in the upper 80s in October in Georgia!!) Seriously, this procedure will make you love rinsing your face in cool water if it’s even slightly warm outside! Day 3: My skin was definitely passable as normal but looked much better with a little foundation on the more red portions. It felt dry through the day and by the end of the day was flaking/peeling. It wasn’t anything crazy looking but definitely there if you looked closely. I was able to work out strenuously and there was no pain or discomfort. Day 4: I had some slight peeling but all the redness was gone and it was not noticeable unless you were looking for it. Day 7: My skin is finished peeling and looks noticeably more “glowing” is the only way I can describe it. The dullness I had before is gone and it definitely looks more youthful. Would I get a Vampire Facial again? I purchased a set of three treatments when I decided to get a Vampire Facial. Honestly, after the first one, I was dreading the second and third because of the discomfort that first day. I communicated with my nurse and she went out of her way the remaining two times to reduce my discomfort and encourage me. The end of the treatment and the remainder of the first day is by far the worst part of the PRP facial process. I spaced my three treatments about 4-6 weeks apart and it has been seven months since my first treatment, 4 since my last. I do love the results I got from my three vampire facials, but I think someone with more mature skin would benefit more from it that I did. For me it wasn’t worth the price tag. My skin is tighter, pores smaller, and there is definitely that “glow” I missed before. The sun spots I was starting to get have also lightened significantly. 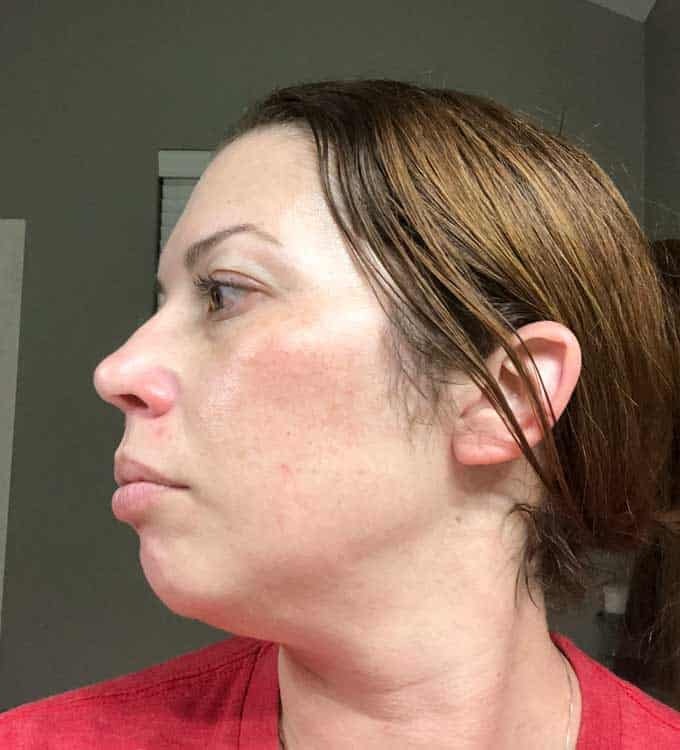 My spa said I would continue to see improvement over the course of a year but even this far out I’m pleased with the results, depite not wanting to do it again..
Rather than repeating the PRP facial in the future I may look into other options for improving my skin such as an IPL laser that may be more cost effective for what I’m looking for. How much does a Vampire Facial Cost? So now to the big question…how much does a vampire facial cost? Obviously, that will vary a lot by where you go and what part of the country you are in. The spa I went to in Savannah, GA charges $600 per treatment or $1500 for a series of three. They also regularly have specials so if you are thinking about making the investment definitely see if the provider you are thinking of has specials or discounts available. I tried to take them in the same light but obviously it’s not perfectly matched. Overall my skin is more even, less dull, and my complexion has really improved. Whew, that may be one of my longest blog posts ever! If you have any questions, please comment below and I will do my best to answer them!